Spend the day at Kings Island - the largest amusement park in the Midwest! Experience a world of fun and ride coasters like the Beast, the Banshee, and the Diamondback. Upgrade to the Ride & Refresh ticket and enjoy unlimited fountain beverages to help cool off during those hot summer months! From some of the most thrilling roller coasters in the world to the 16-time award winning kids area and regions premier water park, there’s fun for everyone in the family at Kings Island! Discover themed areas, each presenting different thrills. 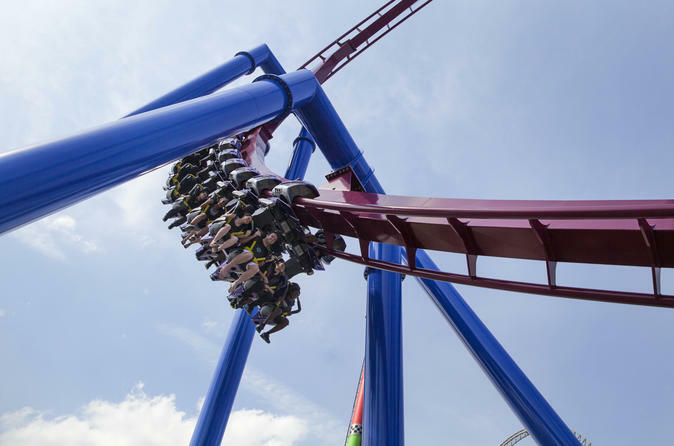 Roller coasters like the Beast which travels up to 65mph, the Banshee with seven stomach-churning inversions and Diamondback, with over 5,000 feet of steep, steel drops - are all ranked among the best in the world! You can't miss riding Mystic Timbers which was voted "Best New Ride in the World" for 2017 by Amusement Today. This 109-foot-tall wooden roller coaster features 16 airtime moments through wooded terrain along 3,265 feet of track at speeds up to 53 mph. The 17 time Golden-Ticket award winning Planet Snoopy features four roller coasters, live shows, PEANUTS meet-and-greets and much more. Kings Island hosts a full line-up of entertainment including gravity defying acrobats, roaming acts, and dancing-in-the-streets! Included in your admission ticket is entry to Soak City Waterpark (open seasonally), where you can swim, slide and splash your way through 36 water slides, two wave pools, rushing rivers, relaxing lagoons, and kids' play areas. This is the ultimate place for families to catch some rays. Open select dates during summer (late May to early September). Upgrade Option: Choose to upgrade your experience with the Ride & Refresh ticket, which includes unlimited fountain drinks all day long! Special Offer - Book and travel by August 26 and save 13% off our previously offered price! - Book Now!